Complete CT degradation was achieved by SPC/Fe(II)/FA system. Formic acid established the reductive circumstance by producing CO2·–. CO2·– was the dominant active species responsible for CT degradation. CT degradation was favorable in the pH range from 3.0 to 9.0. SPC/Fe(II)/FA system may be suitable for CT remediation in contaminated groundwater. The performance of sodium percarbonate (SPC) activated with ferrous ion (Fe(II)) with the addition of formic acid (FA) to stimulate the degradation of carbon tetrachloride (CT) was investigated. Results showed that CT could be entirely reduced within 15 min in the system at a variety of SPC/Fe(II)/FA/CT molar ratios in experimental level. Scavenging tests indicated that carbon dioxide radical anion (CO2·–) was the dominant reactive oxygen species responsible for CT degradation. CT degradation rate, to a large extent, increased with increasing dosages of chemical agents and the optimal molar ratio of SPC/Fe(II)/FA/CT was set as 60/60/60/1. The initial concentration of CT can hardly affect the CT removal, while CT degradation was favorable in the pH range of 3.0–9.0, but apparently inhibited at pH 12. Cl– and HCO3– of high concentration showed negative impact on CT removal. Cl– released from CT was detected and the results confirmed nearly complete mineralization of CT. CT degradation was proposed by reductive C-Cl bond splitting. This study demonstrated that SPC activated with Fe(II) with the addition of FA may be promising technique for CT remediation in contaminated groundwater. Release of halogenated aliphatic hydrocarbons to soils and groundwater is a widespread environmental problem since they are toxic and possess the risk of carcinogenicity . Carbon tetrachloride (CT), widely used as degreasing agents, washing solvents, and intermediates in chemical industries , is a sort of saturated perhalogenated aliphatic hydrocarbons that is frequently detected in groundwater, and its toxicity generates great attention due to its long environmental half-life and recalcitrant characteristics. As one of the most commonly used prior poisonous contaminant, CT has been discovered in many serious hazardous sites that listed in the United States Environmental Protection Agency’s National Priority List . With a relatively high solubility of 805 mg·L–1 at 20℃ in water , CT can be transported in a wide range of groundwater. Therefore, developing an effective, simple and eco-friendly technique for CT removal in groundwater is necessary and is currently attracting much attention by many researchers. CT is difficult to degrade naturally and is easily accumulated in natural environment such as soil, sediment and aquifer . Traditional chemical methods for CT removal involve in situ chemical reduction (ISCR) and in situ chemical oxidation (ISCO). One kind of ISCR mechanisms is direct chemical reduction with reductive metals, such as zero valent iron (ZVI) , or Fe minerals reduced by bacteria in a biologically active system including goethite, hematite, and magnetite . In contrast, ISCO is commonly considered to be of low efficiency in the removal of CT because CT, a highly oxidized form under a highest carbon oxidation level of+IV, is resisted to be degraded through oxidative pathway . However, ISCO process, such as catalyzed hydrogen peroxide (CHP) or activated persulfate (PS), is proved to be effective in removal of polychlorinated or perchlorinated hydrocarbons when some organic solvents are added into the system. For instance, hydrogen peroxide (H2O2) and potassium persulfate (K2S2O8), when activated by ultraviolet (UV), are effective in mineralizing trichloroacetic acid (TCAA) in aqueous solutions in the presence of formic acid or methanol . CT in aqueous solution was mineralized by the UVC-photolysis of H2O2 with the addition of methanol through reductive C-Cl bond splitting . Moreover, previous studies showed the degradation of CT is slowed down by the thermally activated PS process, while with the addition of formic acid, CT could be degraded at a high rate and carbon dioxide radical anion (CO2·–) was considered to be the dominant active species responsible for CT removal . In brief, by adding organic solvents, such as formic acid or methanol into the ISCO process, reductive free radicals will be generated, and they will make the system possessing the ability to reduce target substances like perchlorinated hydrocarbons. Traditionally, H2O2 is often used to generate hydroxyl radical (HO·, E0 = 2.7 V) in Fenton system , which is a powerful and non-selective oxidant that can attack most target contaminants. However, H2O2 is not a stable chemical and cannot be maintained effectively in contaminated sites in a long-term period. In addition, the main drawback of above-mentioned cases is the way how H2O2 or persulfate is activated since both UV and thermal activation actually limit the application in remediation of contaminated soils and groundwater. Recently, sodium percarbonate (SPC) has come into the sight as a new alternative oxidant in replacing H2O2 in ISCO process . SPC, when dissolved in water, disassociates to liquid H2O2, as shown in Eq. (1). Compared to liquid H2O2, SPC is cheap, large-scale industrial chemical that is nontoxic and relatively stable solid. In addition, SPC can be effectively applied over a wide pH range. Thus, Fe(II)-catalyzed SPC oxidation has been successfully tested as a modified-Fenton system for the treatment of many pollutants in ISCO process, such as trichloroethylene (TCE), perchloroethylene (PCE), and benzene in the authors’ previous researches [14,15]. This reminds the authors that it might be possible to take Fe(II)-catalyzed SPC in the presence of formic acid (FA) as a modified-Fenton system to degrade CT, and the system may possess the ability to generate reductive radicals such as CO2·–. So far, studies on the application of Fe(II)-catalyzed SPC in the presence of formic acid in removing CT had less documented, especially the dominated radicals during the reaction and the degradation pathway are still unclear. 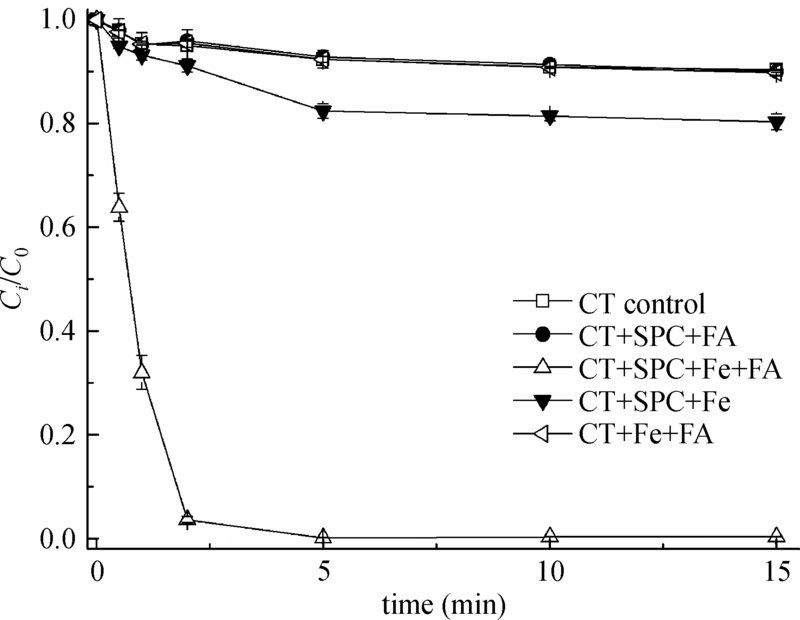 Therefore the main contents of this article are: (1) to investigate the CT reduction performance in SPC/Fe(II)/FA system; (2) to explore the main free radicals that accounted for CT degradation by scavenging test; (3) to consider the effects of the molar ratio of SPC/Fe(II)/FA/CT, initial pH and ions on CT removal; (4) to discuss the transformation mechanism of CT and assess the extent of CT mineralization via chloride ion released from CT compound. Carbon tetrachloride (CCl4, CT, 99.5%) and methyl viologen (MV2+) were purchased from Aladdin Reagent Co. Ltd. (Shanghai, China). Sodium percarbonate (Na2CO3·1.5H2O2, SPC, 98%) was purchased from Acros Organics (Shanghai, China). Methanol (CH3OH, 99.9%), formic acid (99.0%), 1,10-phenanthroline monohydrate (C12H8N2·H2O, 98%), n-hexane (C6H14, 97%), tert-butyl alcohol ((CH3)3OH, TBA, 99%), and trichloromethane (CHCl3, 99%) were purchased from Shanghai Jingchun Reagent Co. Ltd. (Shanghai, China). Hydrogen peroxide (H2O2, 30%) was bought from Sinopharm Chemical Reagent Co. Ltd. (Shanghai, China). Sulfate heptahydrate Iron (II) (FeSO4·7H2O, 99.0%), sodium bicarbonate (NaHCO3, 99.5%), sodium chloride (NaCl, 99.5%), sodium sulfate (Na2SO4, 99.0%) and sodium nitrate (NaNO3, 99.0%) were acquired from Shanghai Lingfeng Chemical Reagent Co. Ltd. (Shanghai, China). Ultra-pure grade water produced through Milli-Q water system (Classic DI, ELGA, Marlow, UK) was used to prepare water solutions used in all tests. The mother liquor of CT (200 mg·L–1) was prepared by the pure liquid CT after totally dissolved in ultra-pure water under stirring over 1.0 h in a tightly capped dark glass bottle of 100 mL, then diluted to the designated concentration. The experiments were designed in several cylindrical glass bottles (250 mL) with a cooling jacket around and set at a controlled steady temperature around 20℃ under circulating water bath. Magnetic stirrers were used to make sure the uniformity of CT solution in all tests. 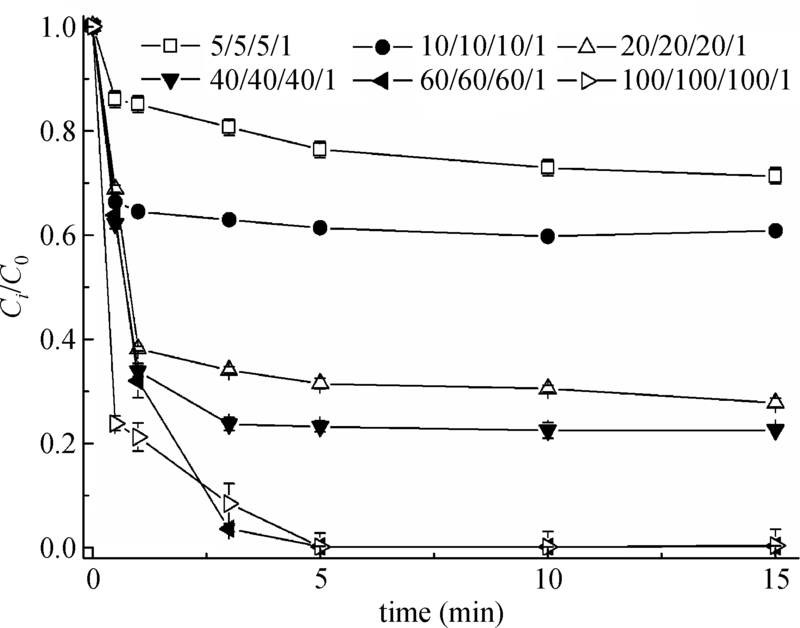 Both FeSO4·7H2O and FA reagents were added in the reactor at the desired concentrations except the oxidant SPC before starting the experiments. 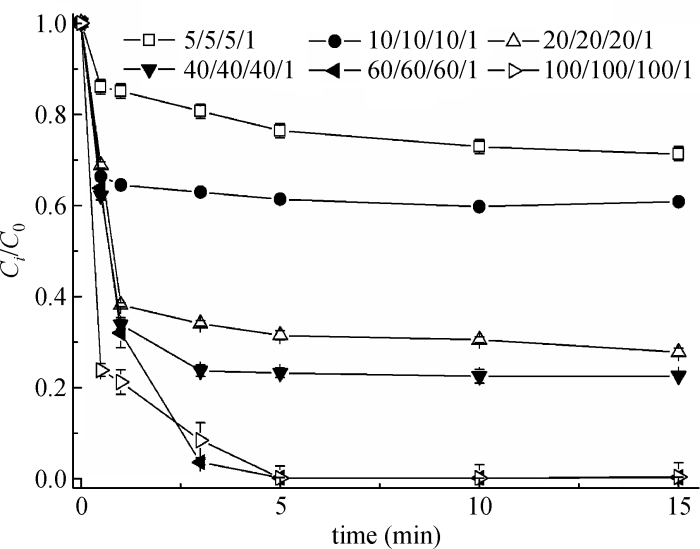 At each designated sampling interval, samples were withdrawn from the opening at the top of the reactor and the reaction was promptly quenched with n-hexane addition. The solution pH was out of regulation initially, except for investigating the effect of solution pH. All the tests, as well as the control tests, were repeated in triplicate and then the mean values were reported. Samples of CT (1.0 mL) were withdrawn from the aqueous solution at predetermined times and extracted with n-hexane (1.0 mL) for 3 min with the help of a whirling mixer. After 5 min centrifugation, the supernatant of organic phase containing CT was transferred to 2.0 mL sample vial. The concentration of CT was measured by chromatography (GC) at a split ratio of 20:1, 1.0- mL sample was injected into the detector. GC (Agilent 7890A, Palo Alto, CA, USA) was equipped with an electron capture detector (ECD), an auto sampler (Agilent 7693), and a DB-VRX column (60 m length, 250 mm i.d., and 1.4 mm thickness). The temperature of the injection port was set at 240℃, detection port at 260℃ and the oven at 100℃. To explore the degradation pathway of CT, the GC/MS (Agilent 7890/5975) equipped with a DB-VRX column and an automatic sampler (Tekmar Atomx, Mason, OH, USA) was used to analyze the possible intermediates using the EPA SW-846 Method 8260B. The concentration of Fe(II) was determined using the 1,10-phenanthroline method . Hydrogen peroxide was determined spectrophotometrically using TiOSO4 method . Quantitative analysis of chloride ion was performed with ion chromatography (Dionex ICS-I000, Sunnyvale, CA, USA). The pH of all solutions was recorded by a pH/ORP meter (HANNA instruments HI 2213, Romania). Figure 1 presents the degradation tendencies of CT in the Fe(II) activated SPC system in the addition of FA as well as in various control groups. Control tests were carried out in CT solution, CT solution in the addition of Fe(II) and FA, and CT solution in the addition of SPC and FA, respectively. The results showed that only 9.7%, 10.2% and 10.0% CT was lost within the initial 15 min reaction due to the volatilization of CT. It is also noted that Fe(II) activated SPC could not degrade CT effectively, i.e., only 19.7% CT loss in Fe(II) activated SPC system. This result was well understood since HO· radical would be generated through the reaction of Fe(II) and H2O2 released from the dissolved SPC as shown in Eq. (1), but it is difficult for HO· attacking with C-Cl bonds , which means CT cannot be degraded by HO· radicals. However, it should not be neglected that this slight increase of CT removal compared with the data in the above mentioned three control groups indicated that the presence of other reactive oxygen radicals (ROS) might be responsible for CT removal in Fe(II) activated SPC system. Superoxide anion (O2·–) was suspected here contributing to CT removal as it can be generated by the scavenging of HO· by H2O2 through the reactions Eqs. (2) and (3) . And CT, commonly used as probe compound of O2·–, is ideally degraded by O2·– (k= 1.6 × 1010 M-1s-1) . Nevertheless, with the characteristics of high degree solvation and transient existence, O2·– performed a low efficiency in CT removal. Fortunately, once both Fe(II) and FA were added into the system along with SPC, CT was rapidly degraded to 27.3% in the initial 1 min, and the degradation of CT dropped later but a complete CT removal was achieved within 15 min, showing an obvious two-staged reaction similar to most oxidation processes using Fe(II) as catalyst. These results strongly indicated the effectiveness of SPC/Fe(II)/FA system in CT degradation. Apparently, the addition of FA can turn the oxidative circumstance of the original reaction mixture established by SPC and Fe(II) into a reductive one by yielding CO2·– radicals through Eqs. (4) and (5) . With a standard reduction potential of -1.93 V vs. normal hydrogen electrode, CO2·– radical is a relatively strong one-electron reductant commonly used in aqueous chemistry and it has been reported to transfer an electron rapidly to viologen ions, quinones, porphyrins, pyridinium, nitro and nitroso compounds, oxygen and chlorinated compounds [19,20]. Thus, CO2·– radical was regarded as the main radical being responsible for CT degradation in SPC/Fe(II)/FA system. According to our previous study , CO2·– may present in PS-based ISCO process in the addition of FA, and here, SPC/Fe(II)/FA system also has the potential in generating reductive species such as CO2·– and O2·–. Thus, both CO2·– and O2·– were supposed to be simultaneously existed in SPC/Fe(II)/FA aqueous solution. The results of only 19.7% CT loss as shown in Fig. 1 indicated that O2·– is not significantly effective in degrading CT in SPC/Fe(II) system. To clearly measure the function of O2·– in SPC/Fe(II)/FA system, the scavenger of O2·–, chloroform (CF) was employed because its positive reactivity with O2·– in aqueous solution (kO2·– = 3 × 1010 M-1s-1) . Result from Fig. 2 shows that there is no obvious difference of CT removal efficiency between without scavenger group and CF group (100-fold initial CT concentration), suggested that O2·–, at least, was not responsible for CT removal in SPC/Fe(II)/FA system. While, when FA was added to SPC/Fe(II) system, remarkable CT removal was achieved as CO2·– may lead to CT reduction. Therefore, we have to make it clear that how CO2·– was formed and whether it goes the way through Eqs. (4) and (5). To further confirm the above hypothesis, first we scavenged HO· radicals since HO· may play an important role in accelerating CO2·– radicals through Eqs. (4) and (5). TBA was selected as the scavenger of HO· radicals as its high reaction rates with HO· (kHO· = 5.2 × 108 M-1s-1) . Figure 2 presented the CT degradation performance by the scavenging of HO·. It can be seen that CT removal was inhibited. Although HO· cannot degrade CT directly, the scavenging of HO· affected the generation of CO2·– radicals and thus, resulted in the decrease of CT removal. Thus, we suggested that HO· radical was the precursor radical and was much related to the formation of CO2·– radical. In addition, methyl viologen (MV2+) was utilized here as the effective scavenger of CO2·– to verify the prime function of CO2·– for CT reduction in this system. MV2+ has been proved to react with CO2·– actively by many researchers , as shown in Eq. (6). Figure 2 presented the influence of MV2+ on the reduction of CT. CT was almost completely removed without MV2+ addition. Whereas the concentration of MV2+ was 1.3 mmol·L–1 (10-fold initial CT concentration), there was only 21.5% degradation of CT in 15 min. 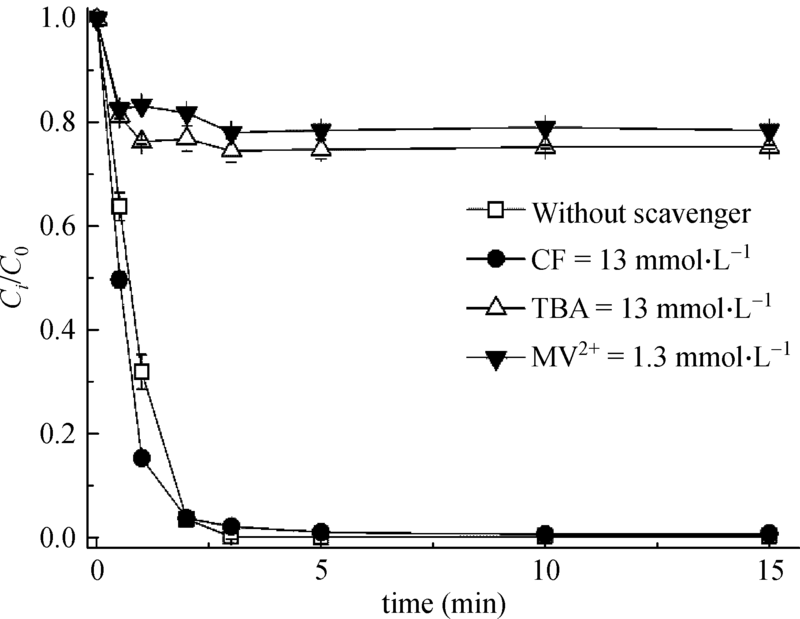 These results obviously suggested that the reaction between CO2·– and CT was hindered by MV2+. Therefore, It was believed that CO2·– would be the main responsible active species for CT reduction in the SPC/Fe(II)/FA system. CT reduction performance under a range of SPC/Fe(II)/FA molar ratios (from 5/5/5/1 to 100/100/100/1) at a fixed CT concentration of 0.13 mmol·L-1 in SPC/Fe(II)/FA system is presented in Fig. 3. The increase of CT removal was in accordance with the increased dosages of chemicals. In addition, a rapid degradation of CT occurred within the initial 3 min. This can be explained by the acidic condition (pH= 2.58) caused by the addition of FA, which is in the optimal pH range for Fenton reaction . So, the addition of FA, to some extent, created an acidic condition and reinforced the reaction rate of Fenton’s agents. After 3 min, CT degradation slowed down and totally ended within 15 min. Moreover, the complete reduction of CT was achieved over 5 min since the removal of CT accumulated over 98.2% at molar ratios of 60/60/60/1 and over 96.3% at molar ratios of 100/100/100/1, which has never been reported in literatures. The tests were continued to examine the influence of initial dosages of SPC, Fe(II), FA, as well as CT on the performance of CT removal by setting SPC/Fe(II)/FA/CT at different molar ratios, and the results are shown in Fig. 4. It was concluded from Fig. 4(a) that with the increase of initial SPC dosage of the molar ratio of SPC/Fe(II)/FA/CT from 20/60/60/1 to 40/60/60/1, CT removal increased significantly from 53.2% to 78.6% within 15 min, and complete CT reduction was observed at molar ratio of 60/60/60/1 of SPC/Fe(II)/FA/CT. This elevated CT removal was contributed to the increased SPC dosage that supplied more H2O2 to generate HO· radical, and thus more CO2·- was produced. On the other hand, the increased SPC dosage generated large amount of H2O2, and thus more radical species, such as HO· and O2·- radicals, are available to react with the intermediates produced, since more relevant propagation reactions and kinetics occurred . By contrast, excessive SPC would negatively affect CT removal, i.e., SPC dosage increase from molar ratio of 60/60/60/1 to 120/60/60/1 of SPC/Fe(II)/FA/CT made a decrease of CT removal from 99.9% to 81.4% within 15 min. With the large dosage of SPC, H2O2 released in excess and later scavenged reactive oxygen species, as shown in Eq. (2) and Eq. (7) . This reduced the intensity of HO· and caused a less accumulation of reductive species later by the reaction between HO· and FA. When fixing the SPC/FA/CT molar ratio at 60/60/1 and varying Fe(II) dosage from 60/20/60/1 to 60/120/60/1 molar ratio of SPC/Fe(II)/FA/CT, the effect of Fe(II) on CT removal behavior was evaluated, together with the outcomes are presented in Fig. 4(b). From the lines it could be learned that CT degradation increased in accordance with the Fe(II) dosage ranging from 60/20/60/1 to 60/60/60/1 of molar ratio of the SPC/Fe(II)/FA/CT. This was because Fe(II) promoted the generation of more HO·, and complete CT removal was achieved at 60/60/60/1 within 15 min. By contrast, CT removal reversed when increasing the molar ratio of SPC/Fe(II)/FA/CT up to 60/120/60/1. This can be explained by the quenching reaction between Fe2+ and HO· that occurred in the SPC/Fe(II)/FA system at a relatively high Fe(II) concentration, as shown in Eq. (8) . For these reasons, in SPC/Fe(II)/FA system, there must be an optimum Fe(II) concentration for CT removal, and the molar ratio of SPC/Fe(II)/CT was fixed at 60/60/1 for further study. The same results were observed for FA dosage evaluation, as shown in Fig. 4(c). Apparently CT removal increased from 79.1% to 94.8% as FA dosage increased from 60/60/20/1 to 60/60/40/1 of molar ratio of the SPC/Fe(II)/FA/CT, and complete CT removal could be obtained within 15 min at the SPC/Fe(II)/FA/CT molar ratio of 60/60/60/1. However, CT degradation was significantly inhibited when FA presented in abundant compared to SPC and Fe(II), for example, CT degradation dropped to 74% at the molar ratio of 60/60/120/1 of SPC/Fe(II)/FA/CT. Excessive CO2·- generated by superfluous FA resulted in CO2·- radical self coupling, which was presented in Eq. (9), thus negatively affected CT removal efficiency. In addition, excessive FA will keep the pH value at a very low level while the CO2·- radical protonates in strongly acidic solution, as shown in Eq. (10) , and these make sense to the suppression of CT degradation performance when FA presented in excess. Moreover, CT degradation performed roughly the same results that initial CT concentrations (0.013 mmol·L-1, 0.026 mmol·L-1, 0.065 mmol·L-1 and 0.130 mmol·L-1) has little effect on CT removal at a fixed molar ratio of SPC/Fe(II)/FA at 60/60/60, as shown in Fig. 4(d), suggesting that CT degradation was effective in the tested initial CT ranges. Based upon the above results, the optimal molar ratio of the SPC/Fe(II)/FA/CT for CT removal at experimental level was set at 60/60/60/1 in aqueous solution. 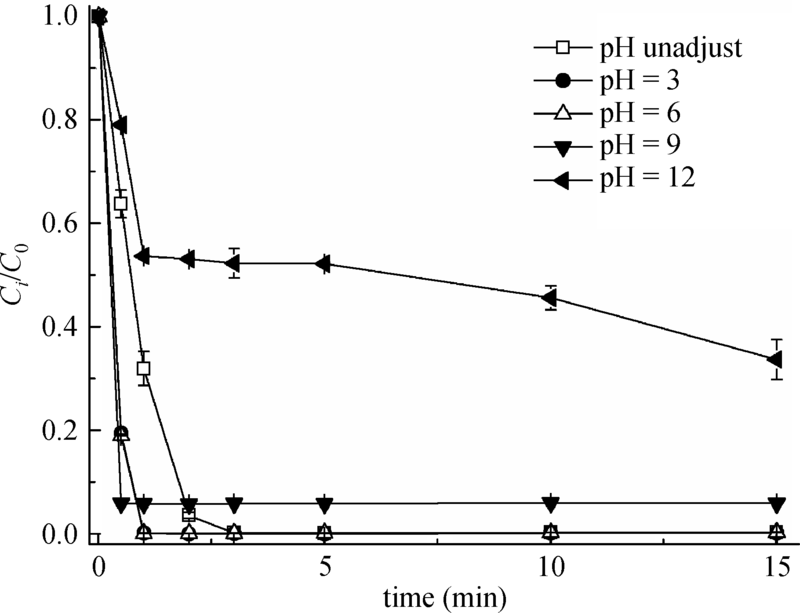 The influence of initial pH on CT degradation was studied through regulating the initial solution pH with 0.1 mol·L-1 H2SO4 or 0.1 mol·L-1 NaOH. The unadjusted pH is 2.58 after addition of FA since FA is a strong acid. The adjusted pH values are 3,6,9 and 12. As shown in Fig. 5, CT degradation at pH 3.0 -6.0 was higher than unadjusted group. Meanwhile, CT degradation was slightly retarded by increasing pH from 6.0 to 9.0, and rapidly dropped down at pH= 12. It was obvious that CT removal in SPC/Fe(II)/FA/CT system was efficient among a wider pH range from 3.0 to 9.0. However, CT removal in strong alkaline condition could be seriously limited since only 66.3% CT was reduced within 15 min at pH= 12. The effectiveness of CT removal under a wider pH range demonstrated the stability and applicability of SPC/Fe(II)/FA technique. In a conventional Fenton reaction, the elevation of pH promotes the precipitation of Fe(OH)3 in aqueous solution, accounting for the decline of HO· intensity and CO2·- accumulated later. Especially, solution with pH= 12 leads to the passivation of the radical reactions, which may be another adverse potential to the system when applied in alkaline environment. The very encouraging point is that the addition of FA would strongly maintain the system staying in weak acidity, although the dissolution of SPC will raise the pH value when initial pH was unadjusted or pH= 3 (shown in Table. 1). When pH>6, the influence of SPC could be ignored because pH of SPC-only group is around 6 -7 (data not shown). In addition, CO2·- radical, generated from the reaction of formate anion and HO·, is stable among a wider pH range as the pKa of conjugate acid of CO2·- is 2.8 [26,27]. Since the pH was higher than 2.8 after reaction, the CT degradation efficiencies were hardly affected by the pH. The pH is usually near neutral in groundwater, hence SPC/Fe(II)/FA technique can be used to most of the CT contaminated groundwater. Chloride ion (Cl-), bicarbonate ion (HCO3-), nitrate ion (NO3-) and sulfate ion (SO42-) are common background anions in groundwater. 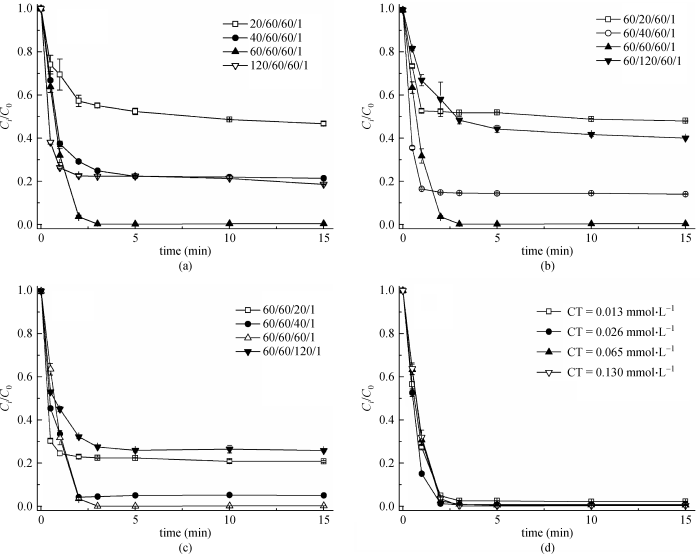 Figures 6a -6d presented the influence of these four ions on CT degradation in SPC/Fe(II)/FA system at 1, 10 and 100 mmol·L–1 individually. It can be seen that Cl- had negative effect on CT removal, and the presence of HCO3- accelerated CT removal in low concentration while inhibition of CT degradation observed at high concentration. Meanwhile, effect of NO3- and SO42- can be neglected under examination concentrations (Figs. 6c and 6d). As shown in Fig. 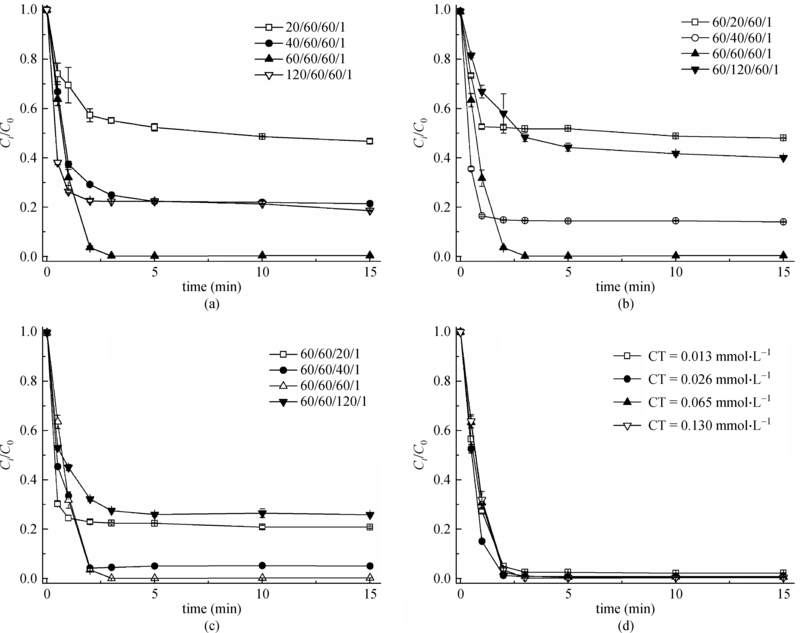 6(a), CT degradation decreased as the Cl- concentration increased, especially with 100 mmol·L–1 Cl-, CT degradation was inhibited to 77%. This can be explained that Cl- has a significant scavenging effect on HO·, shown in Eqs. (11) -(14) , and thus reduced the producing of CO2·- radicals later. Furthermore, it is reported that the produced Cl2·- can also react with formic acid . The influence of HCO3- on CT degradation was presented in Fig. 6(b). It can be seen that the presence of HCO3- sped up the degradation of CT during the first 2 min, which suggesting a positive effect on CT removal and reasons accounted for this can be described by Eqs. (15) -(16) . Bicarbonate can react with HO· to form carbonate radicals (CO3·-), CO3·- can also transform formic acid into CO2·- radicals. However, when the concentration of bicarbonate increased to 100 mmol·L–1, CT degradation was slightly reduced to 93.1% within 15 min. This can be explained by two reasons: (1) When 100 mmol·L–1 HCO3- was added, the pH increased from 2.58 to 6.83. At higher pH value, CT degradation was inhibited, which has been totally discussed in above section; (2) When HCO3- existing in excess, it would scavenge the CO2·- radicals formed inversely through Eq. (17). Meanwhile, at neutral pH, reaction between HCO3- and H2O2 (Eq. (18)) formed peroxymonocarbonate ion (HCO4-), which is similar to BAP (bicarbonate-actived peroxide) system. 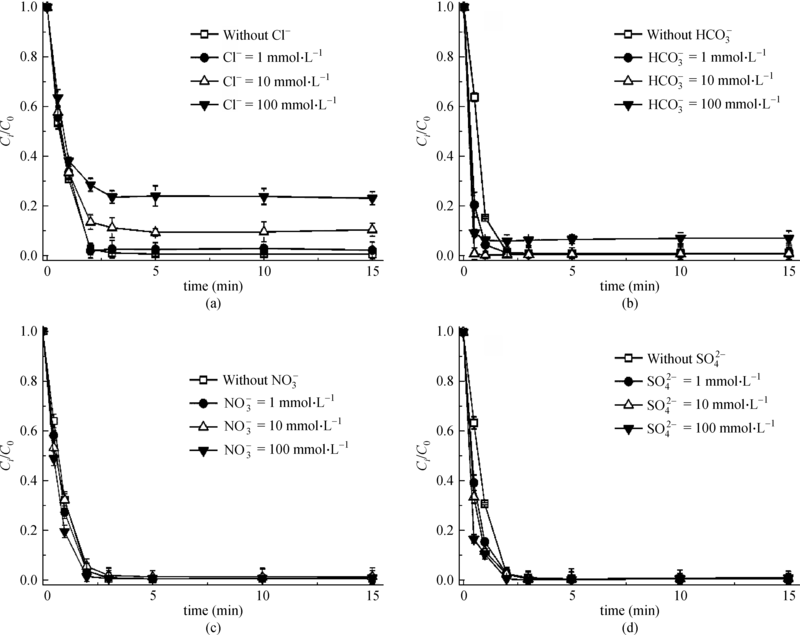 HCO4- is a potent oxidant and cannot reduce CT itself. The chloride ion released from CT was detected, and the residues of Fe(II) as well as H2O2 released from SPC dissolution were measured and displayed in Fig. 7. Theoretically complete dechlorination was assumed to produce Cl- with 4 folds concentration of the initial CT. The detected chloride ion concentration was almost 93% of the theoretical one. The gap between the measured Cl– concentration and the theoretical one indicated the incomplete mineralization of CT, suggesting that there might be chlorinated organic intermediates formed during the CT degradation process (Fig. 7(a)). Studies also reported that Cl– released from the mother chlorinated compounds, along with the intermediates might be further consumed by HO· , as shown in Eqs. (11)–(14). Therefore caused the gap between the detected Cl- line and the theoretical line. This phenomenon was deduced happened as well in this study due to the generation of large amount of HO· in the system. To identify the specific degradation pathways of CT in this study, the authors detected the intermediate products with GC-MS. The analytical results showed that there were no volatile chlorinated products detected, suggesting that CT was transformed into nonvolatile chlorinated compounds or inorganic oxychloride. Based on GC-MS analytical results and literatures survey [32–34], CT degradation pathway was proposed as follow: C-Cl bond of CT was split by CO2·– to form CCl3· and Cl–, C-Cl bond of CCl3· could further break to form dichlorocarbene, or form chloroform (CHCl3). The hydrolysis of dichlorocarbene then could generate HCOO–, Cl– and CO2 . According to the SPC molecular formula, 7.8 mmol·L-1 of SPC was supposed to release 11.7 mmol·L-1 (1.5 fold) H2O2. The H2O2 released by SPC-only test displayed a superb water-solubility of SPC, as shown in Fig. 7(b), SPC was nearly completely dissolved in 2 min. Compared to the H2O2 released by SPC-only test, H2O2 concentration performed a tendency that rising at the beginning, and then decreasing later. This can be explained by the rapid dissolution of SPC along with its consumption through the reaction with Fe(II). After 5 min, the reaction nearly stopped and H2O2 stayed at a relatively low level. Meanwhile, Fe(II) was expended largely at the very beginning in accordance with the decrease of CT, which showed an efficient usage of Fe(II). Therefore, SPC/Fe(II)/FA process is considered to be an environmentally friendly and effective technique for CT remediation in in situ contaminated groundwater. The article significantly investigated the enhanced reductive degradation of CT by SPC activated with ferrous ion with the addition of formic acid. The experimental results demonstrated an important role of FA on CT removal. CT degradation was compliance with the SPC/Fe(II)/FA molar ratio, and complete CT removal was achieved with the optimal molar ratio of SPC/Fe(II)/FA/CT as 60/60/60/1. Several free radical scavenging tests confirmed that CO2·- radical was the dominant reactive oxygen species responsible for CT removal. CT degradation performed well among a wide pH range from 3 -9, which strongly strengthened its application. Cl- and HCO3- of high concentration showed negative effect on CT removal. The chloride ion released from CT compound suggested that CT was nearly complete mineralized in system. CT degradation was proposed by reductive C-Cl bond splitting. In summary, this study provides useful understanding for the remediation of groundwater contaminated by CT using the technique of SPC activated with ferrous ion with the addition of formic acid. Further studies will be emphasized on its application in actual contaminated groundwater remediation practice. This study was financially supported by the grant from the National Natural Science Foundation of China (Grant Nos. 41373094, 21577033, and 51208199) and Natural Science Foundation of Shanghai (No. 16ZR1407200).